Small ‘Trunk’ Table in solid Douglas Fir by Sue Skeen for The New Craftsmen. A stout dining table with solid quadrant legs, finished with a clear matt lacquer. 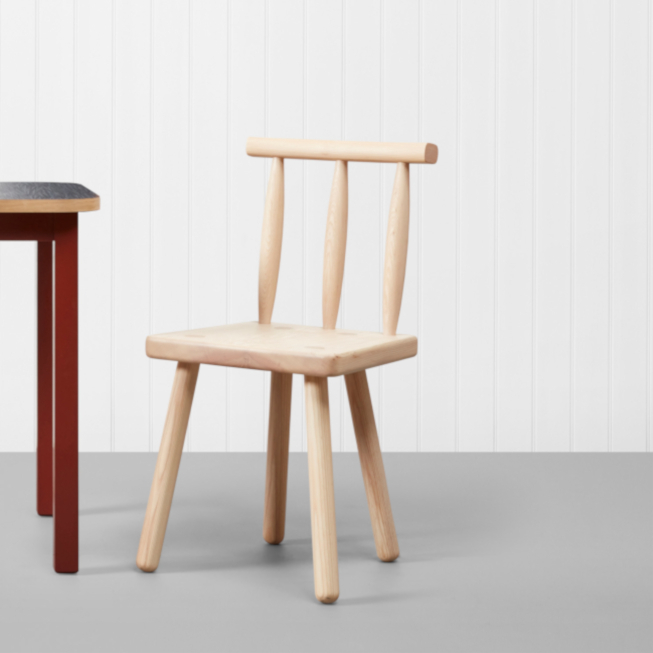 Stylist and imaginer Sue Skeen has collaborated with the makers of The New Craftsmen to create a range of dining furniture for home and hospitality. Our shared vision was to develop a set of timeless designs that would encourage individuality and expression. The COMMON PARTS Collection consists of five shapes and integrates traditional craft skills, still practiced by makers across the British Isles - from leather and stone workers, to rush weavers and lacquerists. Bespoke options are available, including a raw or sealed wood finish. Each piece can also be hand-painted in a gloss finish, with a choice of 7 colours. Sue Skeen is an artist, stylist and art director. She worked for Min Hogg at World of Interiors before turning to freelance collaborations with interiors and industry clients; her production company, Skeen & Co, produced the Habitat catalogue at the turn of the century, and she worked with Ilse Crawford as Deputy Editor at Elle Decoration. She is obsessive about homes and nests, and currently maintains a studio at her home in Suffolk.